Take a peek at prepositions while searching for a missing mouse in this clever concept book from the author of Balancing Act. 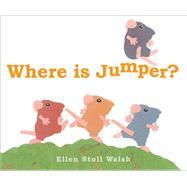 The mice can’t find their friend Jumper! They look over branches and under leaves. They look between the weeds and down into Mole’s tunnel. But still no Jumper. Where, oh where, could their sneaky pal be? In the tradition of Ellen Stoll Walsh’s beloved concept books Balancing Act, Mouse Paint, and Mouse Shapes, this story explores prepositions through the antics of charming, fun-loving mice.